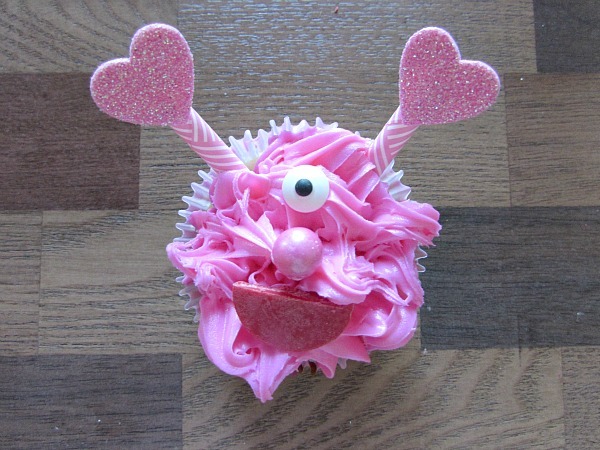 Valentine’s day love monster cupcakes. The cute and cuddly kind that everyone will love. This is an easy to follow tutorial that the kids will absolutely love. They are perfect to make for cute monster parties too! 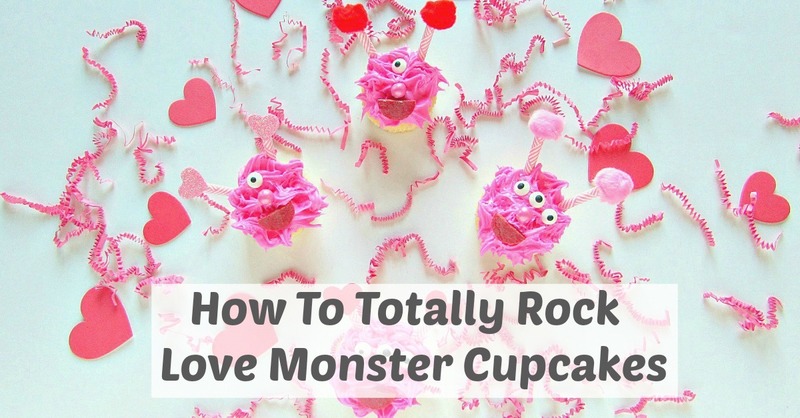 Love monster cupcakes are the cutest dessert for kids! They would be perfect for a class party or Valentines Day. These are not scary monsters they are the cute and cuddly kind. 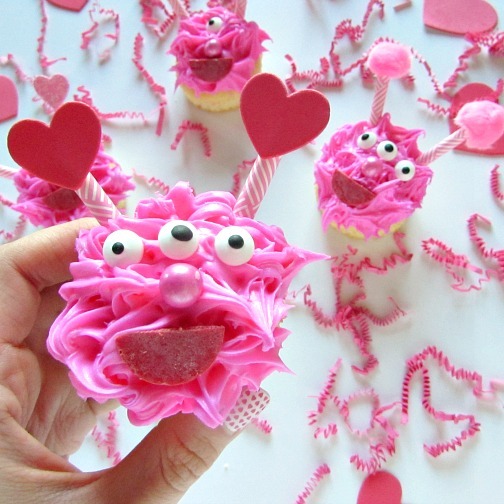 You can also make these monster cupcakes in different colors for a monster party any time of year or keep the pink for a girly monster party. I personally love pink and Valentines Day is the best time of year for pink decorations! It is like a pink explosion at my place right now. I may have gone a little too pink crazy but this is the time of year when you can get away with having so much pink. Pink desserts are also my favorite! 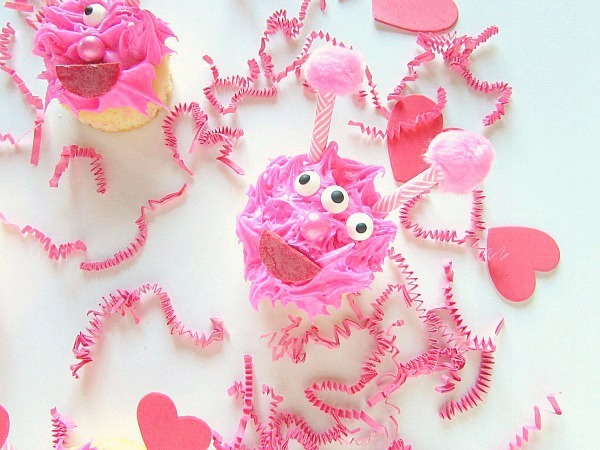 With these pink love monster cupcakes you can get kids involved in the decorating. You can make them your own and they can all be a little bit different. 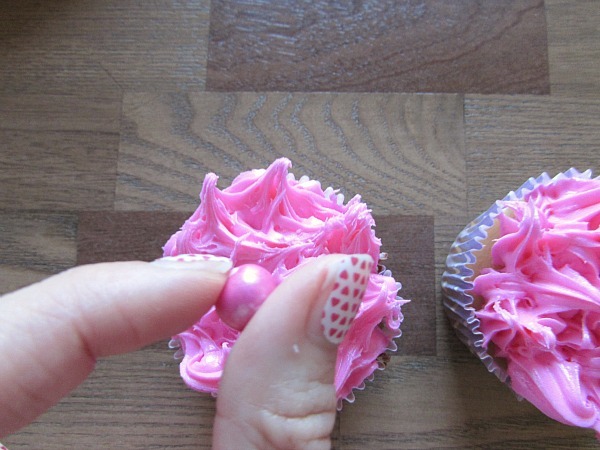 Frost the cupcake with pink frosting. I used an open star tip and just made it look a bit messy. You can also just frost with a knife to make it easier. 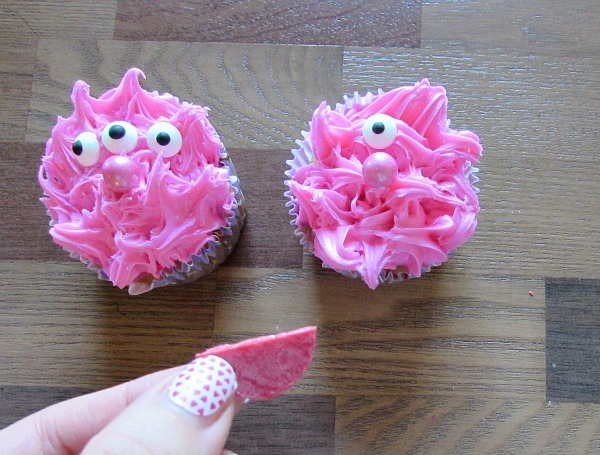 Put the round pink or red sixlet in the middle of the cupcake for the nose. Add candy eyes above the nose. I made some with three eyes and some with one. You can add as many eyes as you want! For the mouth cut a red candy melt in half. Put it under the nose with the round side on the bottom. You can also use black candy melts for the mouth. For the ears I put heart stickers on pieces of paper straws cut in 1 1/2 inch pieces. You could also put the heart stickers on toothpicks. Then slide one into the top left side and one on the top right side of the monster cupcake. I also made some with fuzzy craft balls glued onto the paper straw pieces. 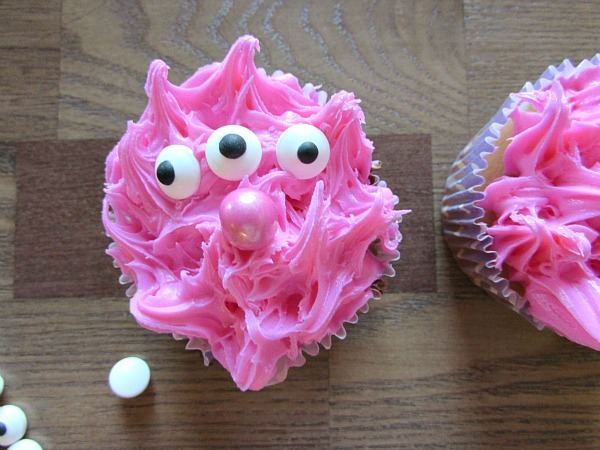 Cute and cuddly little love monster cupcakes! That is how I like my monsters. Do you have some little ones that would love to make these with you for Valentine’s Day? Lol…yes that is a bit of a problem with them Robert!! Absolutely adorable! Thanks for sharing on the Creative K. Kids Tasty Tuesdays Linky Party. I hope you will join us again next week.